TeleTrade is an online broker providing access to trade across a range of financial markets. 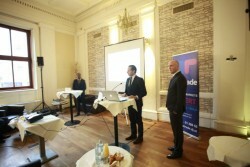 TeleTrade has recently opened an office at the Regus Business Center at Parkring 10 in Vienna's first district. According to the company's website, the TeleTrade Group has over 200 offices in 30 countries and more than 3000 employees. The holding company TeleTrade-DJ International Consulting Ltd was established in 1994 is registered as a Cyprus Investment Firm (CIF) under registration number HE272810. It is licensed by the Cyprus Securities and Exchange Commission (CySEC) under licence number 158/11. Mathias Miller-Aichholz of bma communications competence represents the company in Austria.